Attitude at Altitude Exploring Australias Cool Climates. a serious style of Syrah that really shows its cool climate origin. One of 6 panelist, Loic Avril (Head Sommelier at Dinner By Heston), selected our 2014 Cobaw Ridge Pinot Noir : to showcase as part of 'Working with Pinot'! 2012 Cobaw Ridge Syrah : As "recommend" by Jancis Robinson during the "Australia - The Wild Ones" tasting. From a feature tasting in Gourmet Traveller Wine " pure blackberry fruit is a highlight and lingers on the finish"
2013 Cobaw Ridge Lagrein 95/100 : In the Jeremy Oliver's Top 100 also in The Top Tree Wines from New or Alternative Varieties. "Just opened Cobaw Ridge's 2013 Lagrein. Wow! This piercing, savoury red is quite brilliant." Read the wonderful story Empty Memories by Angela Lloyd https://outofthepress.wordpress.com/2015/01/05/empty-memories/ and descovering our Lagrein. The exhibition shows 15 families in different parts of the world (Europe, North and South America, Asia, Africa, Australia) which have been realized on the occasion of the “International Year of Family farming” of the UN. Project "International Year of family farms 2014"
Remington Norman: October 27,2011: Here are my notes on the 3 wines you sent. The wines of Cobaw Ridge, Macedon Ranges, Australia top wines from Australia's Macedon Ranges (29/09/11)http://www.wineanorak.com/australia/cobawridge. These are brilliant wines, with real personality. My favourite is probably the remarkable Lagrein, but they’re all really good. These are the sorts of wines that Australia should be making more of. Jamie Goode is a UK-based wine journalist, book author and prolific blogger. A short film of me tasting three interesting Chardonnays, two from Australia and one from South Africa. Video : tasting three rather interesting Chardonnays 17 Aug 2011 by Jamie Goode ( London ) jamie goode's wine blog wine journalist, book author and flavour obsessive. Cobaw Ridge Syrah 2007 from Australia's Macedon Ranges (Victoria) - brilliant, fresh, peppery, alive - just gorgeous. The Age. Epicure. 21 st June 2011.
just out of Kyneton, is an entrance to a natural amphitheatre surrounded by rows of vines and now-full dams. 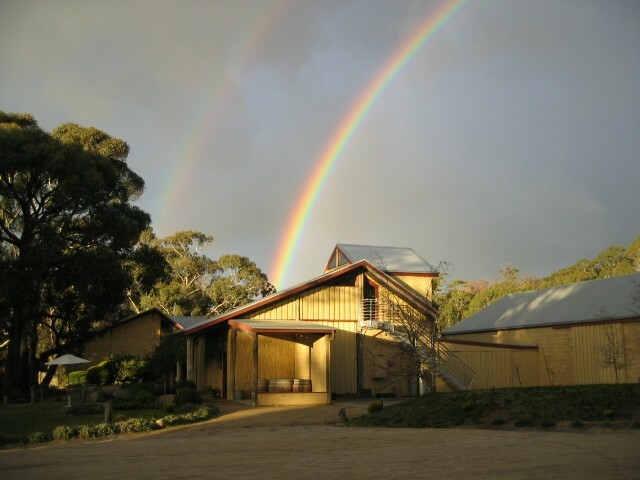 It's a special place and home to Cobaw Ridge, which makes Australia's finest lagrein. Owner-growers Alan and Nelly Cooper also produce excellent chardonnay, syrah and pinot noir but for more than a decade they have been championing this rare red. The Tyrolean Lagrein makes unusually complex, spice-and-velvet reds that offer smoochy character and depth at lower alcohols. Alan Cooper was the first Australian to get onto it. He has two Cobaw vintages available: this, and a slightly more genteel 05 (93+). The wines have a vivid dark cherry nuttiness about them, in a palate that reminds me a little of the best Durif. Typical of the northern Italian reds, the tannins seems otherworldly: where conventional Aussie reds have tannins in their foundations, these seem to float like clouds at different altitudes above the palate, like in grand Barolo. Tantalising and brooding. As of the 26th June 2009 Cobaw Ridge is 'Certified Organic' by the National Association for Sustainable Agriculture Australia (NASAA Registration No.3678). Certification provides verification to the consumer that the grapes are grown using a sustainable organic agricultural system and that the wine is not contaminated or mixed with undesirable additives during processing. We feel these practices will further our holistic, sustainable, and above all natural approach to grape growing and winemaking, and provide an even greater opportunity for the wines to speak of the land which bore them. 2006 Cobaw Ridge Lagrein. Deep purple colour; soft fruit based aromas which follow through onto the palate. Good structure and length. Again, strongly recalls Mourvedre with its earthy tannicity. Plenty of interest and some complexity. Lovely! James Halliday's Wine Atlas of Australia. 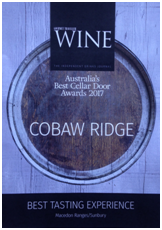 "Cobaw Ridge signature wine, Lagrein... the spicy and aromatic Shiraz Viognier and Chardonnay are also of high quality." "The wines are exemplary. Only Tiny quantities of an excellent Pinot Noir are made. Given the quality of what they do make, it is hoped they persist. The Shiraz Viognier was the first made from the 1996 vintage, making it one of the earlier releases in Australia of this style. What attracts much interest is the Lagrein, a grape from north- east Italy but which makes a much fuller, richer wine in Australia, one which rewards cellaring. "A cuter vineyard and winery you will not find anywhere in Australia. Moreover, it was the first vineyard in Australia to plant commercial quantities of Italian cultivar Lagrein. Never heard of it? Then go and taste it for yourself alongside a juicy, peppery shiraz and refined chardonnay. " "Celebrating 28 years of Budburst!" 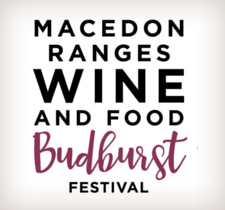 excellence of the region's local wines ...and food. time; singular and full of vitality and character. Chardonnay,il pink rose, Pinot Noir and Syrah. of Kaprica. Carlton and Mr Pietro Fame! To be notified prior, please use our contact form to join our email list. back to top of page.